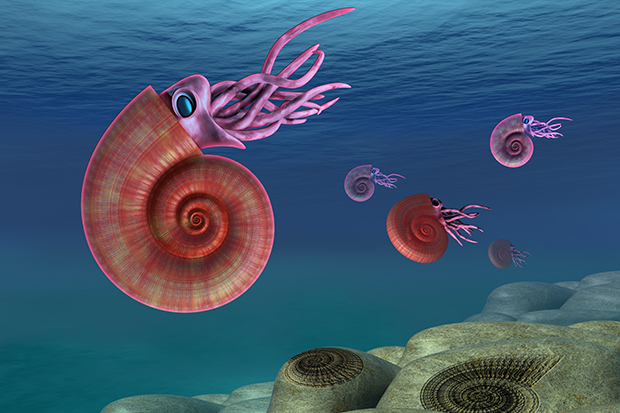 Known for their coiled shells made up of multiple chambers, free-swimming ammonites were common during the Cretaceous and Devonian periods. 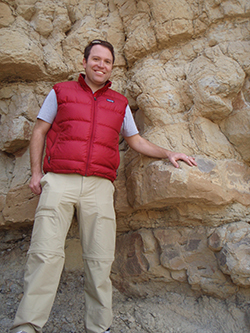 Christopher Junium, assistant professor of Earth sciences in the College of Arts and Sciences, is the recipient of a Faculty Early Career Development (CAREER) award—the highest honor given by the National Science Foundation (NSF) in support of early-career development activities of teacher-scholars. A sedimentary and organic geochemist, Junium will use the five-year award, valued at more than $524,000, to study how marine communities respond to global warming, anoxia (i.e., lack of oxygen) and ocean acidification. His project includes fieldwork in Utah and Colorado, where he will examine the effects of a 94-million-year-old Oceanic Anoxic Event (OAE), as well as trips to Central New York’s Green Lakes and Clark Reservation state parks, whose lakes are highly anoxic and, in some ways, characteristic of an OAE. Like all CAREER projects, Junium’s combines research and education. As such, he will receive generous financial assistance for research staff, equipment and educational work. The research component of Junium’s CAREER project involves OAEs, when parts of the Earth’s oceans were devoid of oxygen for hundreds of thousands of years. He is particularly interested in an OAE from 94 million years ago, during the Cretaceous period, when dinosaurs roamed the Earth. It was a time of tremendous tectonic upheaval, augmented by warm temperatures and shifting sea levels. By studying ancient warming scenarios—specifically, ones preserved in rock in Utah and Colorado, as well as in Central New York, dating back to the Devonian period, some 400 million years ago—Junium hopes to make ecological predictions about the future. For assistance, Junium is turning to scientists at Northwestern University, the University of Massachusetts Amherst, Williams College, Penn State, SUNY Oswego, the University of Delaware and Onondaga Community College (OCC). Junium is also collaborating with colleagues at Syracuse, where he’s figured out how to measure stable isotopes of carbon and nitrogen in the shells and skeletal material of ancient organisms. “Finding out what happened to marine life during an OAE may also answer more basic questions, such as ‘What did ammonites eat for dinner?’” he says. A North Atlantic geologic sample, whose black band signifies an Oceanic Anoxic Event, or OAE. 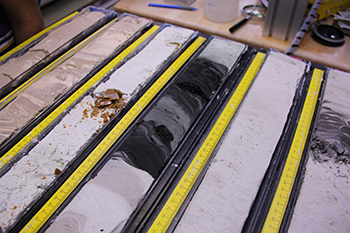 Junium obtained the sample in 2012, while working with the Integrated Ocean Drilling Program. The second facet of Junium’s research involves the chemistry of Syracuse’s Green Lake and its sister, Glacier Lake, in Clark Reservation State Park. That both lakes are characteristic of an OAE provides an array of teaching opportunities. Here, the focus is on the nitrogen cycle—the process by which specialized bacteria convert nitrogen into a usable form, which is absorbed by plants and animals. Junium hopes his research will shed light on how the nitrogen cycle impacts bacteria near the bottom of the lakes. Junium, who found his calling as an undergraduate while studying a rock glacier in Wyoming, is optimistic about the results.